Preference for aromatic rice by consumers is an open secret in the rice sector in Tanzania. But this preference for a distinct scent in rice could be a root cause of stagnating rice production in the country. Local rice varieties grown by farmers are aromatic but low-yielding (producing only 1.8 tons per hectare on average), a production trend that will in the near future not be able to meet the anticipated demand for rice as population increases and incomes rise in the country. Despite having productive capacities that are double or triple those of local rice varieties; improved rice varieties have failed to register success in Tanzania because most the improved varieties developed and proposed so far, are either non-aromatic or at best semi-aromatic. Traders say consumers have little interest in buying non-aromatic or semi-aromatic rice and pay very low prices for it. Researchers from AfricaRice (through the Africa RISING project) in partnership with a local NGO, NAFAKA, have been implementing activities aimed at finding the appropriate middle ground for stakeholders involved in the rice value chain in Tanzania. Through the use of various scientific approaches they hope to provide solutions to the impasse that has stifled efforts to increase rice production in the country. The researchers are first seeking to establish the preferred attributes in rice by consumers and their willingness to pay (WTP) for these attributes. This will be done through experimental auctions to determine the monetary value consumers place on different rice varieties and related reasons. After establishing these reasons, the team will then implement activities to raise consumer awareness about the attributes of rice that can contribute to satisfying some of their nutritional needs. These actions, they believe, will support the yield-improvement efforts currently being conducted to ensure consumers make informed choices about rice products based on other attributes apart from aroma. This work, it is hoped, will open the way for considering policy options to support future improvement of rice quality and for enhancing rice competitiveness and marketing. Consumers have preferences, but are they willing to pay? 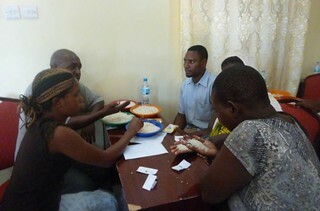 To investigate consumer preferences and willingness to pay (WTP) for various attributes like aroma and grain colour, the team conducted experimental auctions in Morogoro, Tanzania between 13-18 April 2015. The auctions were attended by 131 participants (83% of them women) who were randomly selected from two open air local markets in Mawenzi and Morogoro. 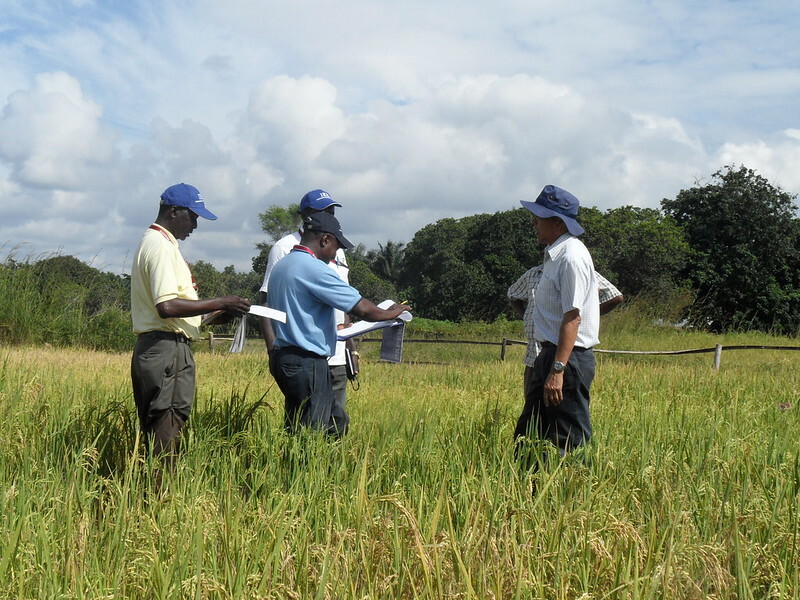 During the experimental auctions, four rice samples were assessed. 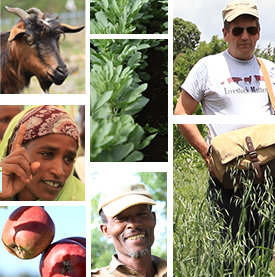 These included two local varieties: SupaKyela, a variety widely known by consumers, and Mbawambiri, a variety that is grown by many farmers but remains largely unknown in the market. The third sample was an improved aromatic rice variety (IR05 N221) that is prone to a comparably higher breakage rate and the fourth was the low quality rice in terms of visual appearance resulting from poor post-harvest handling. This fourth variety was used as the benchmark. The structure used in experimental design was the Vickery 2nd auction within which a winner who proposes the highest price pays the second highest bid. Nine sessions were held; each session included 15 participants (except for the first session that comprised 11 participants). In each session, four rounds of assessing consumer’s willingness to pay were conducted including three individual trials and a collective round. 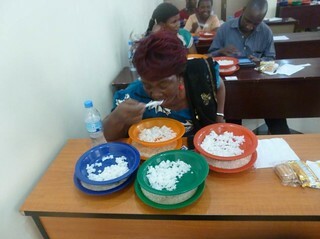 The individual trials involved the assessment of the WTP by each participant of the uncooked rice, the cooked rice and a final individual assessment after the collective round. The collective round involved a discussion and consensus on the willingness to pay by the group made of randomly assigned participants. Results from experimental auction show that the local aromatic rice varieties were preferred to the benchmark rice. In addition to the benchmark rice price of TShs 1,500 (USD 0.65)/kg, for uncooked rice, the WTP for these local aromatic varieties varied between TShs 455 and 496/Kg implying that the consumers can on average pay close to Tshs 2000/Kg on local aromatic varieties. But participants expressed less preference for the improved aromatic rice due to the high percentage of broken grains. The average willingness to pay for this improved variety was negative. The above trends were observed throughout the sessions although the willingness to pay values tended to increase after tasting the cooked rice; in fact 54% of the respondents changed their preference after tasting the rice. Discussions in groups which enable the participants to exchange knowledge and perceptions also influenced the auction outcomes; the WTP above the benchmark price for Mbawambiri declined to TShs 430 TShs/kg whereas for SupaKyela the WTP slightly increased toTShs 509/kg. Overall, aroma is still the key determinant of preferences; however, it is important to note that consumers want rice without a high percentage of broken grains. Variation in appearance can be tolerated to some extent because some dishes like pilau mask the colour of rice. Taste ranks high as a key determinant of repeated consumption. Follow-up experiments will be conducted to confirm the above results. A key message for rice sector stakeholders from the auctions is that growing aromatic varieties is not sufficient. In addition, good milling qualities followed by proper post-harvest handling will give rice producers and traders a niche in the market based on existing consumer preferences. Tags: africa rising, AfricaRice, IITA, rice. Bookmark the permalink.